Osteria Mozza and its Pizzeria sibling opened to unreal levels of hype in 2007; without a doubt the hottest Italian restaurant in LA. I left my first visit there with mixed feelings; yes the food was good but at the same time it felt a bit lacking in creativity. I wouldn't have returned were it not for one of my friend who wanted to celebrate his birthday there. We ended up going with the pasta tasting augmented with a few supplements and I noticed the menu remained very similar to the one I had in 2009. 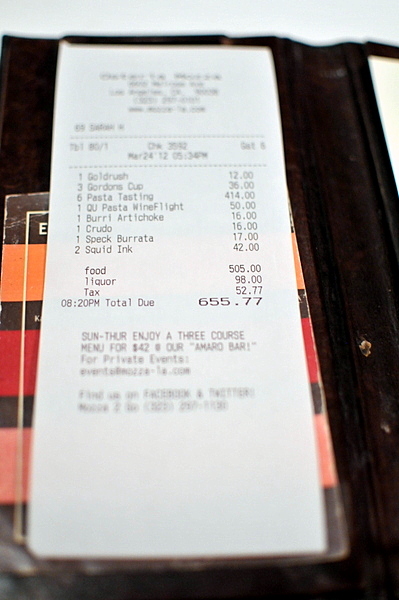 This was clear favorite of the entire table, so much so that we asked for a second serving right before dessert. The chilled noodles posses a deliciously weighty mouth feel and convey the faintest hint of brine which is reinforced by the duet of shellfish. The jalepeño gives the dish a slightly bitter verdance though I would have like a bit more spice. 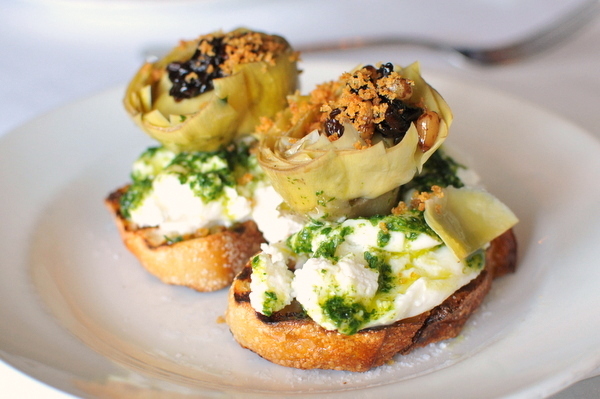 I've loved burrata since my first bite and that passion hasn't dimmed with time. 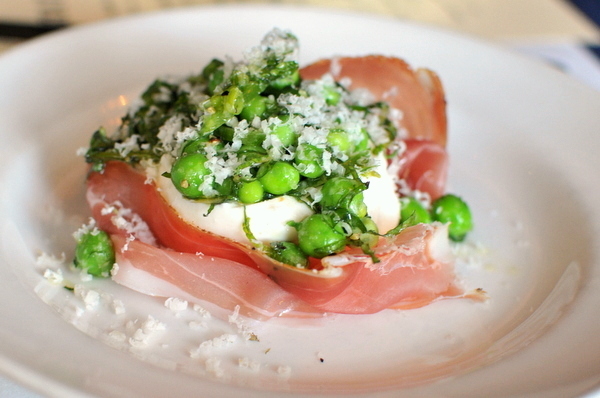 The cheese faintly oozes fresh cream which tempers the weight of the smoky ham and grassy sweetness of the peas and mint. I was a bit wary about the braised artichokes but the dish worked out remarkably well. The creamy cheese is fairly mild which lets the complex medley of nutty, sweet, and vegetal flavors combine nicely. After a few false starts with crudo I've come to appreciate the more varied flavors Italian cuisine can bring to raw fish. The quality of the Amberjack was above reproach and the flavors worked well but I just would have liked them to be a bit more apparent. 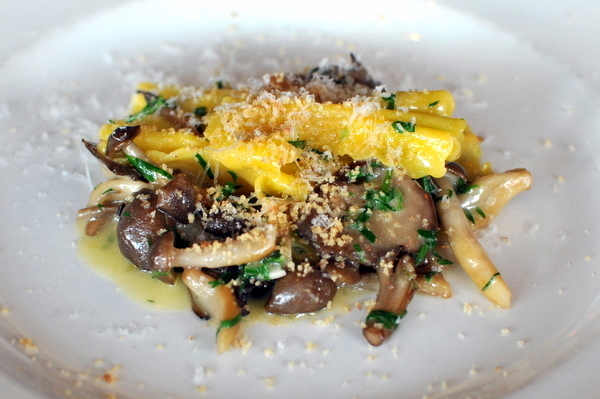 The tasting menu began with a bow tie pasta paired with mixed mushrooms and walnuts. The earthy savor of the mushrooms is readily apparent as is the aromatic fragrance of the fresh herbs. This stuffed pasta from Modena is supposed shaped to resemble a small hat though I had a hard time recognizing it as such. The filling is a heady mixture of cheese and veal. 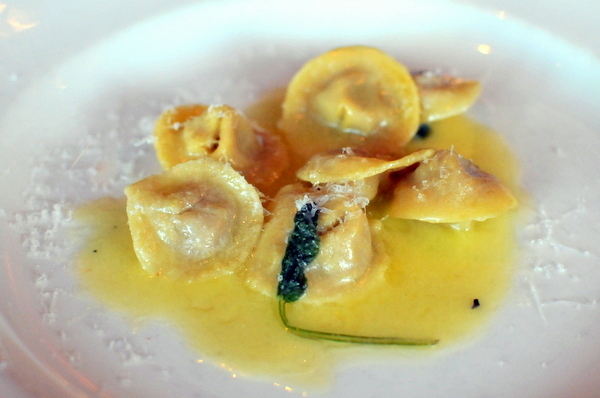 The accompanying sauce is a mix of butter and sage by turns both herbaceous and rich. From here on out the pastas become noticeably heavier and more tomato based. 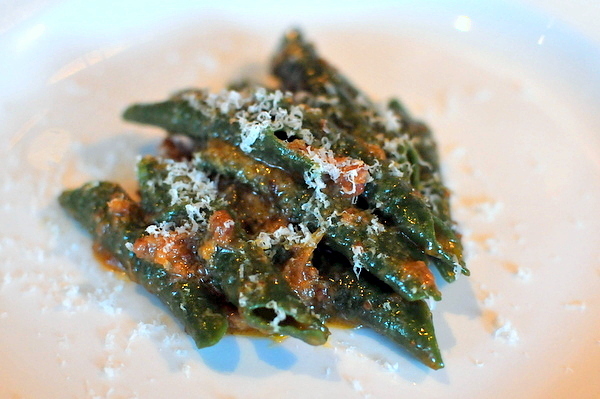 First up a dense green pasta paired with a classical rendition of what has become the quintessential pasta sauce. The Rigatoncini, a curved tubular pasta wasn't particularly impressive but the sauce was quite enjoyable. 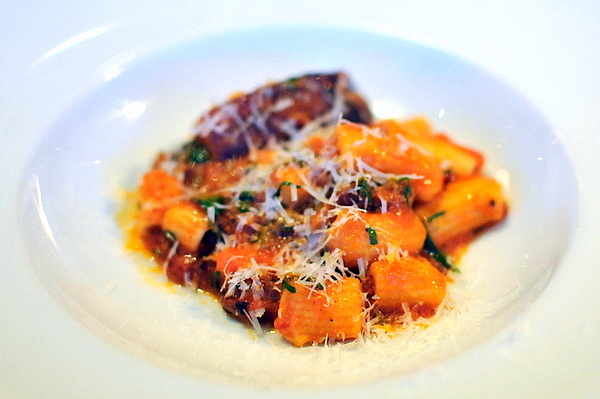 The fresh tang of the tomato is complimented by the robust meaty verve of guanciale; think pork cheek bacon. The sauce doesn't end there with the heady sweetness of cooked onion and a dash of spice for good measure. 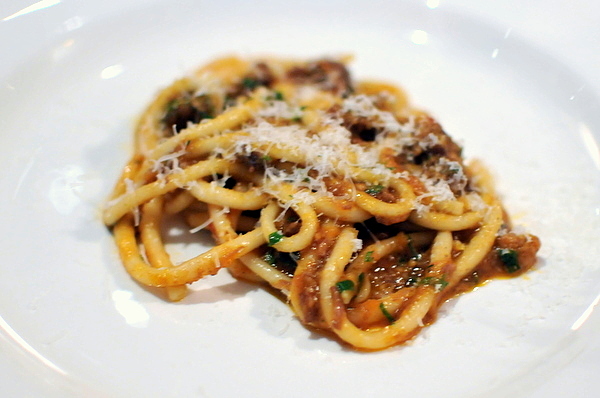 Pici a handmade pasta is akin to a thick spaghetti paired with a rich boar ragù. Rich heavy and hearty a simplistic but fitting final dish. A simple yet immensely effective intermezzo, the floral perfume of the hibiscus is paired with a contrasting bitter tang from the sorbetto: racy, sweet, and refreshing. 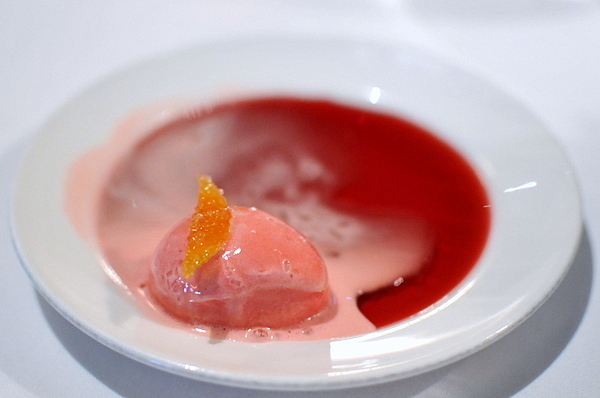 This dessert has remained unchanged from my visit back in 2009 but my impression of it has. What I found lackluster before I found immensely enjoyable this time around. It doesn't hurt that olive oil ice cream has rapidly become one of my favorite desserts. The dense crust on the cake hides a moist simple interior that soaks up the savor of the ice cream. Fresh sprigs of rosemary give the dish a piercing minty herbaceousness. Overall my feelings towards Mozza haven't changed much since my last visit. 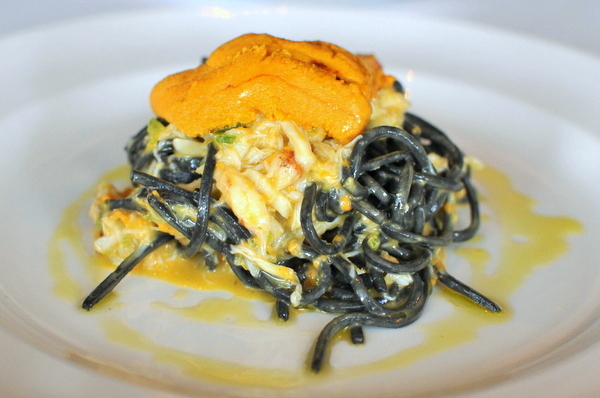 The food is solid but a but aside from the squid ink pasta feels a bit stolid. While you will still get a good meal, Osteria Mozza has neither the contemporary penache of Scarpetta nor the soulful rusticity of Sotto. 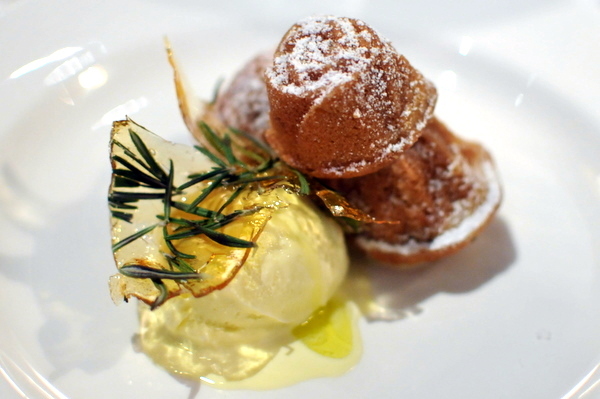 Its fair to say that desserts often get the short shrift when it comes to dining out. Though we all love sweets their placement at the end of a meal often makes them an afterthought or even forgone altogether in some circumstances. As a result pastry chefs often don't get the respect they deserve from their peers in the kitchen. To combat that image, Carlos Enriquez and Ramon Perez have gathered several of LA's top pastry chefs David Rodriguez (Providence), Waylynn Lucas (Fonuts) and Kei Hasegawa (Matsuhisa) and put together the 5weet & Savory Benefit dinner where their skills with both sweet and savory will be on display. Proceeds from the dinner will go to benefit Share Our Strength, a non-profit dedicated to combating childhood hunger. 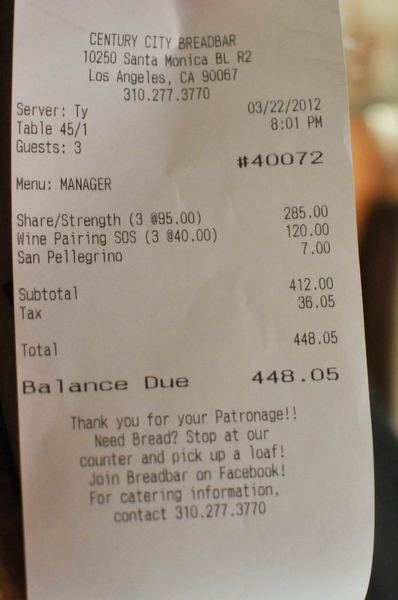 Instead of a traditional wine pairing, the meal featured an unconventional mix of wine, beer, and cocktails. Devon Espinosa of ink was on hand to help out with the cocktails, while Julie Rodin formerly of New Moon Restaurant and Bar handled the wine and beer. She not only set up the pairings but worked with Justin and Sabina Vineyards and Ladyface Alehouse who donated the drinks to show their support. I was a bit leery of how the peanut butter would play out but this dish turned out remarkably well. 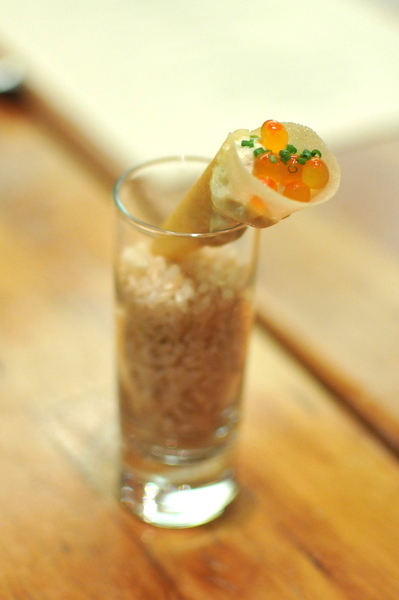 The wrapper had a lovely fried sapor that played very well with the salty pop of the roe. 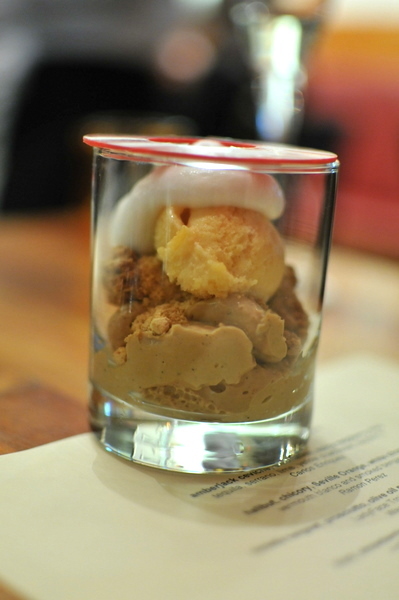 The tofu and peanut butter were more textural elements adding a full creamy body to the mix. After the first course Devon noticed that we were without cocktails and generously provided us with a sample of his springtime creations. 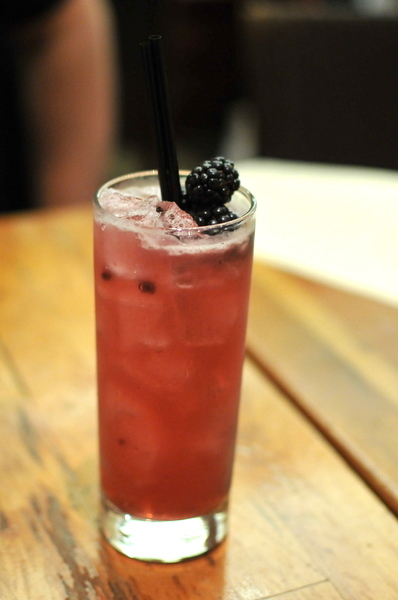 I really enjoyed the rose water and st. germain, their heady floral tones augmenting the blackberries and lemon making for a deeply aromatic fruity cocktail that doesn't feel overy sweet or syrupy. My favorite of the three cocktails the drink begins with the stinging aroma of fresh orange zest and that bitterness is apparent on the palate tempered slightly by the honey. The bourbon is apparent on the finish and helps give the drink some bite. 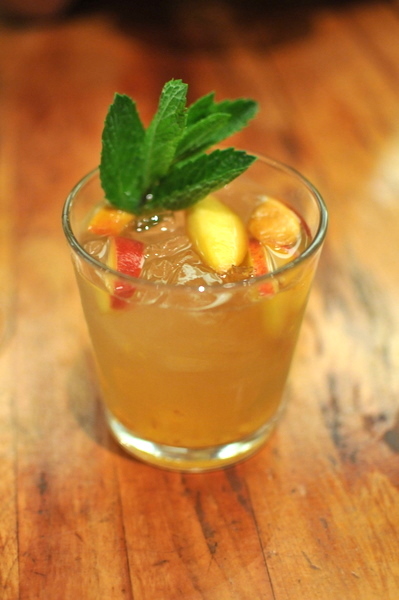 Rounding out the trio is a lush sangria, the lightly effervescent concoction is filled with the fragrance of juicy white peaches and crushed mint. 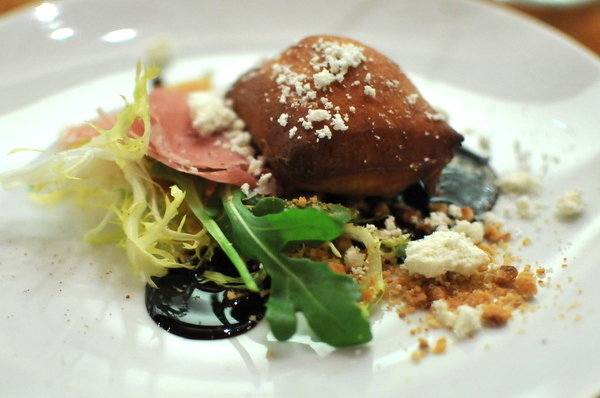 Chef Enriquez went with a safe choice for his savory, going with a dish from his childhood. The result is a pretty classic ceviche and though the avocado feels a touch monolithic at times. The paired cocktail was absolutely integral adding both fruity sweetness and a spicy kick that really fleshed out the dish. I'm always wary about overcooked halibut but this was prepared beautifully resulting in a toothsome flakes of moist white fish. The aroma of the dish reminded me of a sausage pizza and the taste did nothing to dispel the image. Bold savoriness, with a tings of smoke and aromatics, not a conventional flavor profile for fish but delicious nonetheless. Waylynn plays to her strengths here making a savory donut of sorts. The combination of prosciutto and melty raclette reminds me of a croque monsieur while the accompaniments add lively hints of acidity and bitterness. I'd never heard of LadyFace, a small microbrewery in Agoura Hills before this meal and was pleasantly surprised by their tripel. I'll have to keep an eye out for more of their beers. The duck breast was cooked perfectly firm and toothsome with just a tinge of gamy richness. 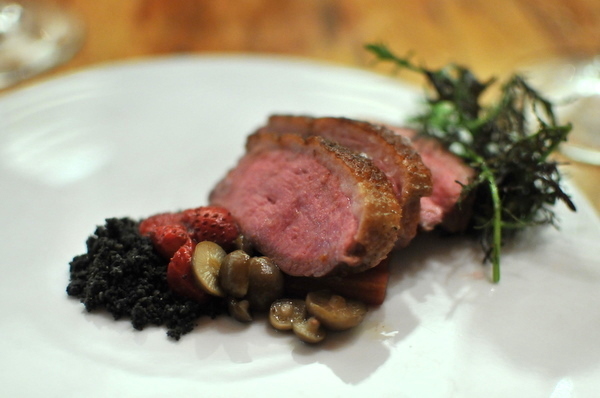 I could have enjoyed the breast solo but the berries and mushrooms offer very well balanced accents to the bird. The cab was pretty classic and satisfying, heavier than I would normally pair with duck but the jammy sweetness of the strawberry and rhubarb held up nicely against the wine. As much as I disdain olives, I'm a fiend for olive oil in my desserts. Unfortunately the strawberry and tarragon run away with this dish and the resultant flavor is like an herb-tinged strawberry shortcake. Still tasty but just not as complex as I had hoped. Perez demonstrates some real finesse with this one. 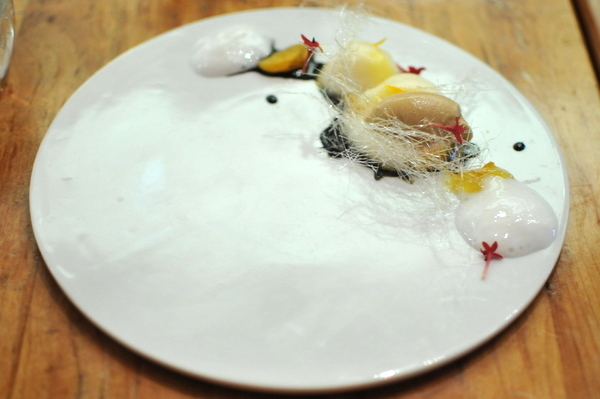 The milk bears an ethereal gamy tang reminiscent of a sheep's milk cheese. I worried that the licorice and fennel would be too intense, but the flavors were in tune with the character of the dish. The accompanying drink was well matched, like an alcoholic Orange Julius. Built around the classic pairing of mint and chocolate, the flavor of eucalyptus and the complex textural interplay help make this dish memorable. 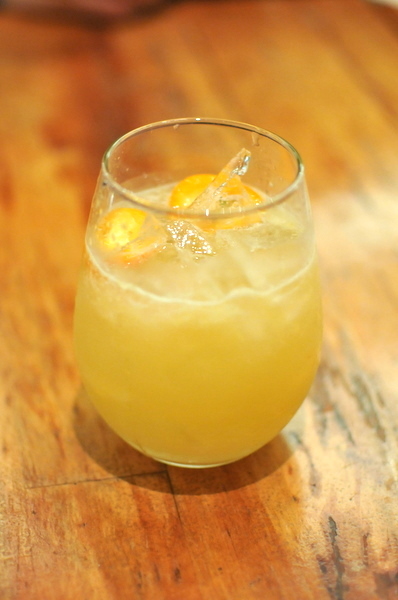 The cocktail captures many of the same flavors as the dessert but tinged with the burn of alcohol. After the initial flavor of York Peppermint Patty fades, there is a lingering bitterness that reminded me of Chinese herbal medicine. The final dessert was a play on a flourless chocolate cake. 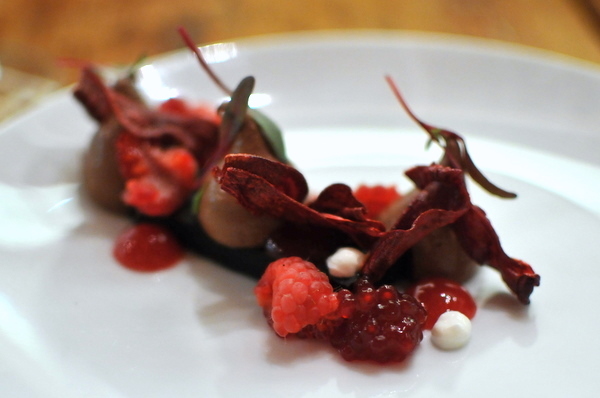 The "cake" was a dense compressed bar of dark chocolate cream flavored heavily with raspberries. The beet chips were a nice addition both for their crunchy texture and light chip-like sapor. 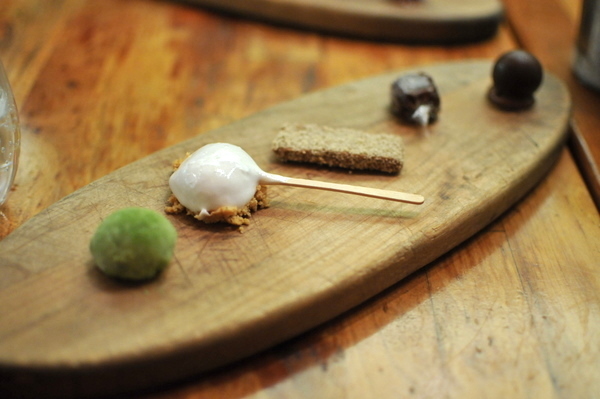 Unsurprisingly this was one of the more creative sets of mignardise that I remember. While all five were good I thought Rodriguez's lollipop was the best with its creamy white chocolate exterior wrapped around a core of sweet buttery goodness and dusted with feuilletine for some texture. I came to this meal with some doubts, while nobody would question the chefs' proficiency with sweets, I did wonder about the some of the savory courses. In the end, the meal exceeded my expectations, none of the savories were groundbreaking but they all were well designed and well executed. My biggest concern was the prevalence of sweet ingredients in the savory dishes, but they were integrated surprisingly well. 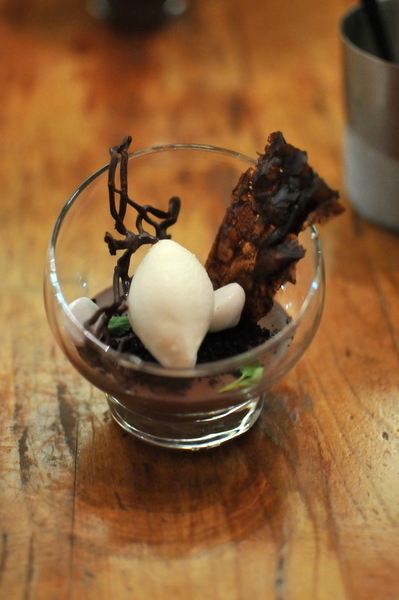 Desserts naturally were even more impressive with the savory elements substantially enhancing the dishes as a whole. It was nice to see the pastry chefs, the pariahs of the kitchen, take center stage; that the proceeds from the meal went to help a worthy cause was icing on the cake. 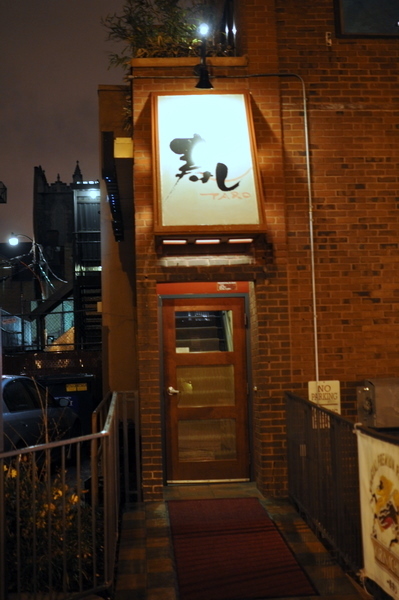 Despite having been open for 26 years and being one of DC's oldest sushi restaurants, Sushi Taro somehow manages to fly under the radar. It baffled me that a restaurant considered among DC's best for sushi with such longevity wasn't an institution in the DC area. What I'd failed to take into account was that the current Sushi Taro only came about a few years earlier. 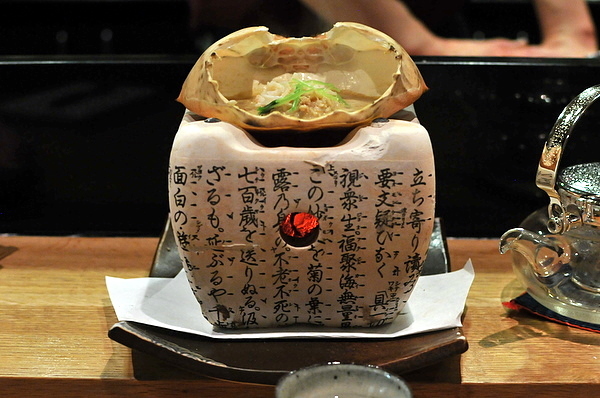 The restaurant is currently run by Jin and Nobu Yamazaki, but it was started by their father. Jin typically handles the business end of things while Nobu is responsible for developing the menu. 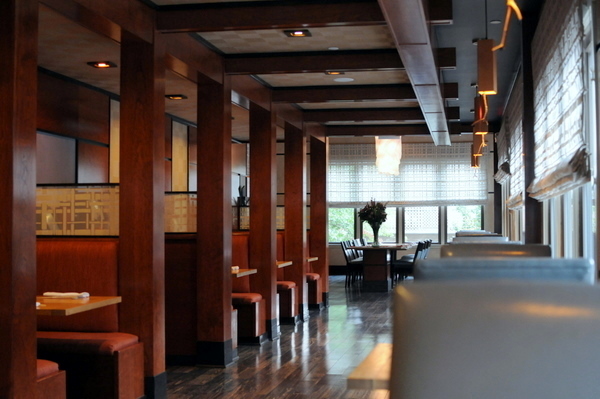 In its original incarnation, the restaurant was more of a neighborhood sushi spot, offering the typical slate of Americanized rolls as well as sushi. 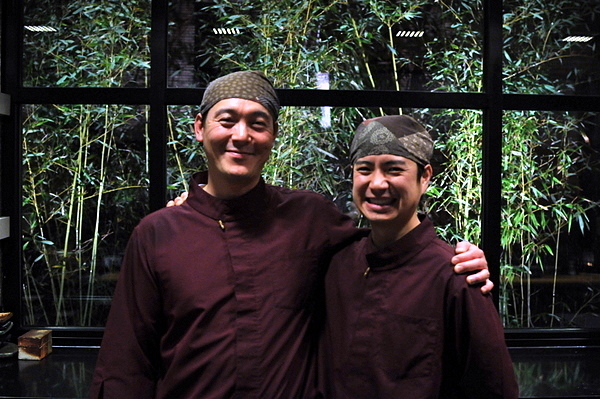 In late 2008 Nobu and Jin made the decision to change the restaurant's strategy and offer more traditional Japanese cooking; as Nobu put it "changing the direction of Japanese cooking in this city." To that end, they closed the restaurant, redecorated the dining room, remodeled the kitchen, and introduced a new kaiseki menu format. In addition to the regular menu, Sushi Taro offers a special Omakase counter that requires reservations at least 48 hours in advance. The counter is hidden in the back corner of the restaurant and the tiny room seats up to six, though the chefs typically prefer to serve no more than four people a night. 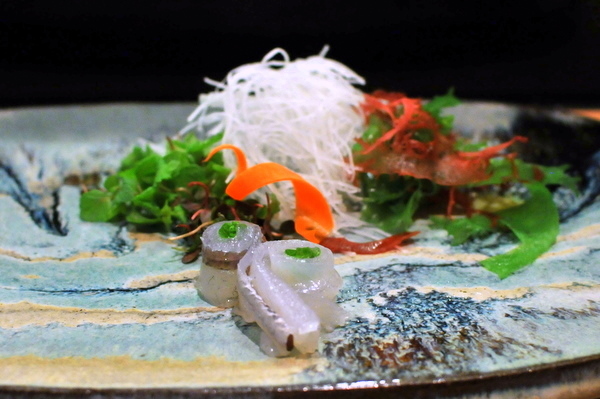 Guests at the bar are treated to seasonal delights served by Nobu and the restaurant's CdC Masa Kitayama. To some extent, the bar is as much for them as it is for us, giving them a forum where they can practice their craft unfettered by mundane concerns like commercial viability. 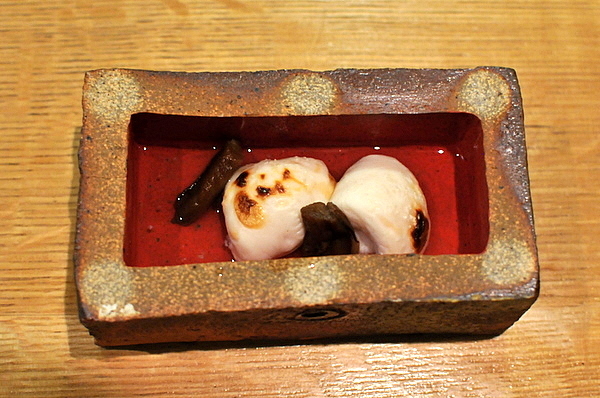 The regular kaiseki starts with this course as well, but this preparation has a much more nuanced flavor thanks to the a short stint over a charcoal grill. 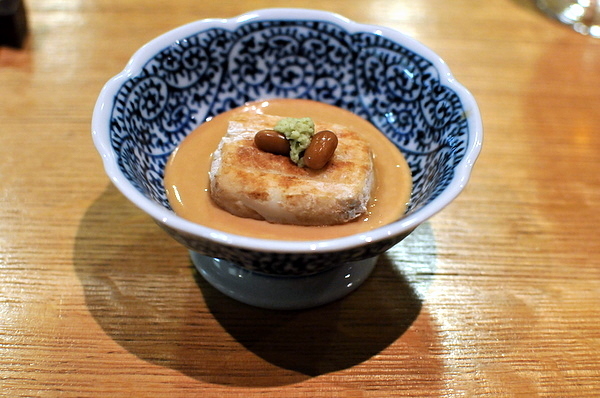 The tofu develops a firm smoky skin around the tender jellied interior, quite nice with the bracing spice of the wasabi. 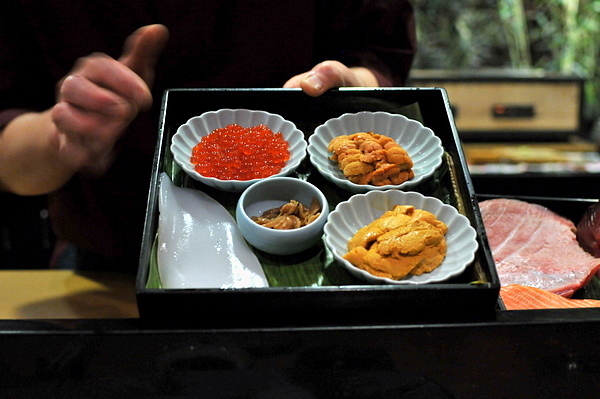 Kaiseki meals are heavily dependent on the season and this course was inspired by the Hinamatsuri, the Japanese Doll Festival which takes place on March 3. To that end the course is named Kai-awase after a clam shell-matching game played during the festival. 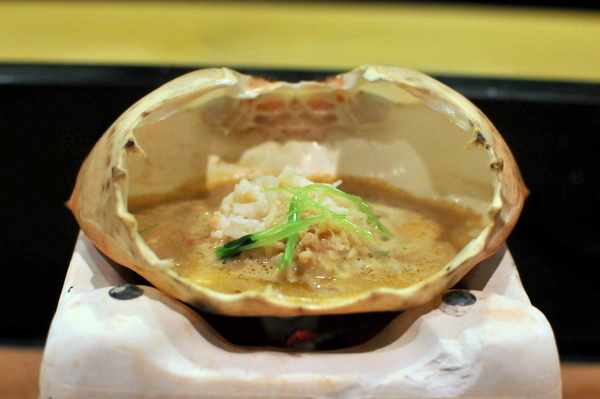 The two shells feature very different ingredients that all compliment one another very well and we were told to alternate between bites to get the full experience. 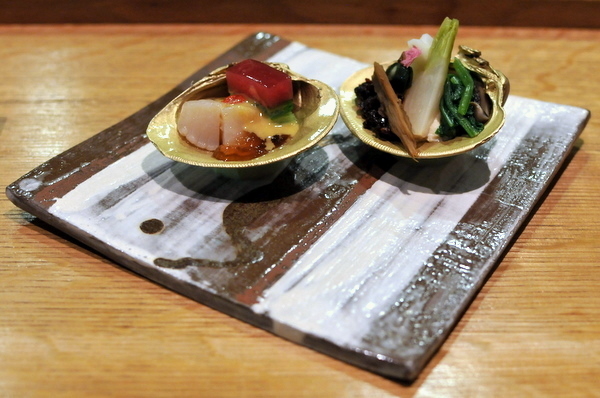 The left clam shell contains two pieces of swimmingly fresh orange clam with a bright mustard jelly and fresh scallion. 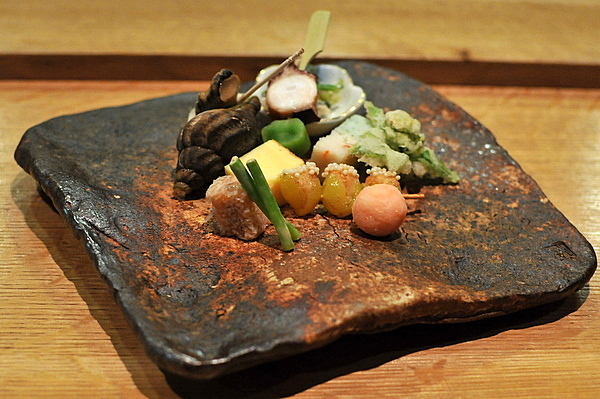 The other contains a verdant mix of spring vegetables with some sweetness from the miso soil. This was my second experience with Tuna spinal fluid. The jelly carries just a hint of clean brine while the ikura and uni add their own styles of salinity augmenting the delicate flavor of the jelly. I would have preferred they clean the bones a bit more thoroughly as the gristle was a bit disconcerting, but the the flavor was pure bliss. 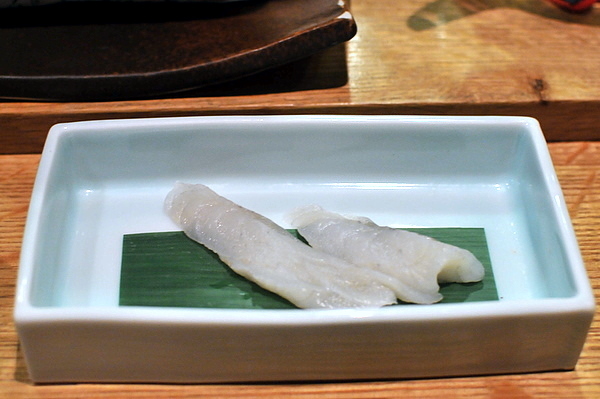 Next up was a presentation of thinly sliced flounder that had been freshly killed that morning. 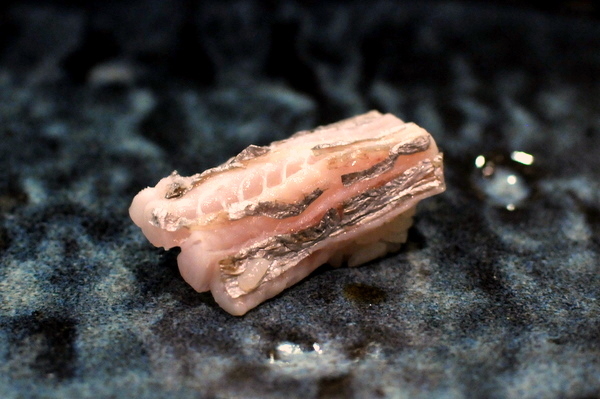 The delicate pieces of translucent flesh are snappy and mild making the ponzu a must. The liver reminded me of ankimo with the same livery tang but not quite rich. Lastly the Engawa was a special treat, despite a muscular texture the abductor also exhibited a spectacular oiliness comparable to toro. I've had entire meals that didn't have as many ingredients as this single plate. Hassun is a staple of Kaiseki meals; the dish consists of numerous smaller elements and is typically used to set the seasonal theme. Rather than describe everything on the plate I'll focus on a couple highlights. The octopus with its deep brine and dense tender texture was my clear favorite. I quite enjoyed the whelk as well, dense toothsome and savory without too much of the earthy funk typical of conch or whelk. The butterbur blossom tempura was another star, its verdant sapor tempering its companion, a tiny cuboid of fish cake and king crab. At this point we were presented a serving platter and two types of soy one traditional to be mixed with wasabi and the other filled with grated ginger. 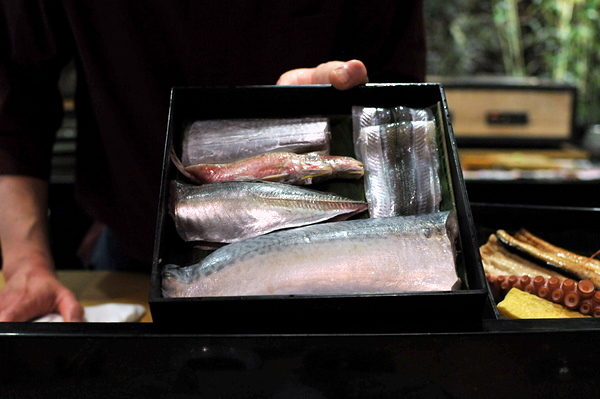 The chefs retrieved six black lacquer display boxes and proceeded to explain the night's fish selection. 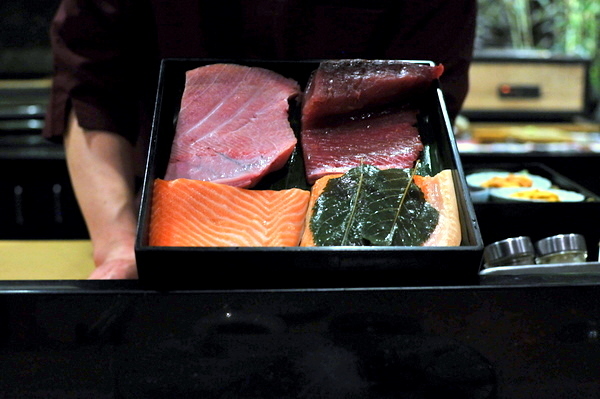 We were then given the option of selecting our own sashimi courses or trusting the chefs to select the best pieces. Naturally given the nature of the meal I went for the second option. 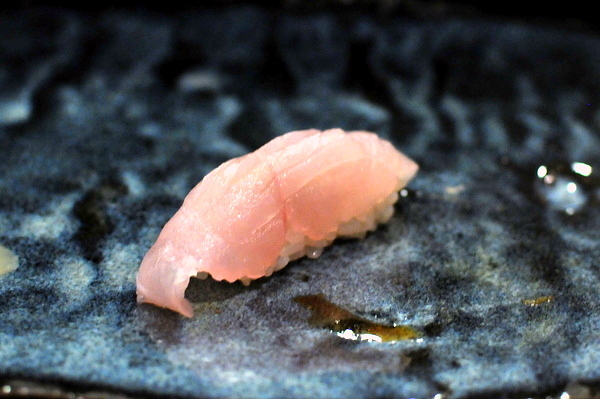 This was a new fish for me, the mild supple flesh lends itself well to salinity of the kobujime or kelp marinade. 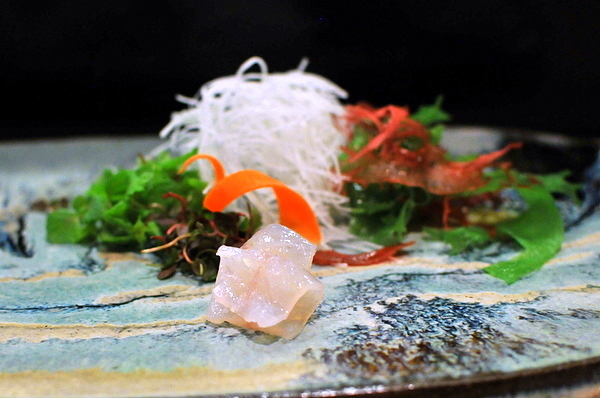 Another delicate white fish, the sayuri came classically prepared with a sliver of fragrant Japanese mint. Nobu recommended using the ginger soy which gave the fish a bit of spice. 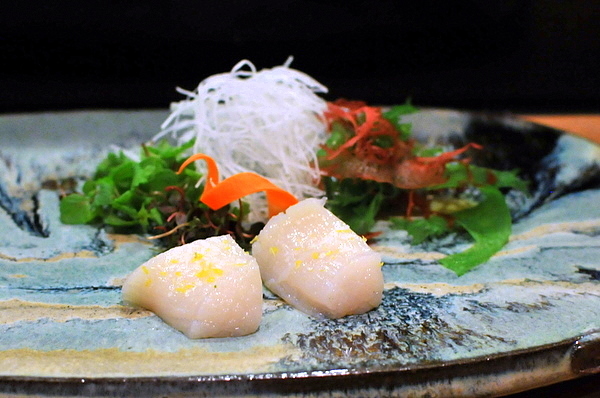 The scallop came topped with a generous dusting of yuzu zest and fleur de sel. The citrus is intense on the nose and lends the shellfish a wonderful fruity interplay with the salt. 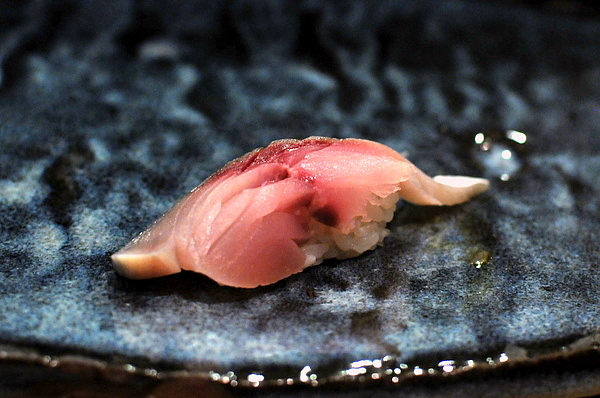 This piece of Chu-toro exhibits touches of both the clean flavor of maguro and the richness of toro. 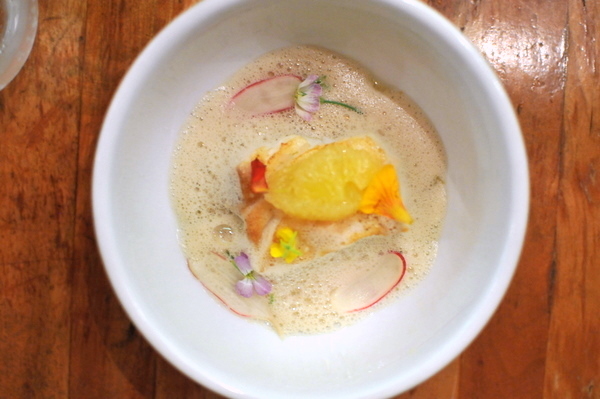 The fish turns slightly creamy upon mastication while the oiliness grows and lingers on the palate. 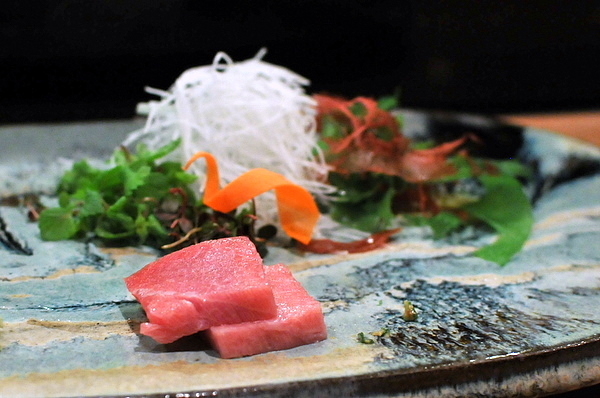 Buri tends to exhibit more seasonal variety then typical farm raised yellowtail. Though the fish is rightly prized for its oiliness, this was a firmer leaner presentation more sweet than fat. The sashimi came with an added surprise a piece of toro charred over the grill adding a wicked smokiness to the already delicious belly fat. 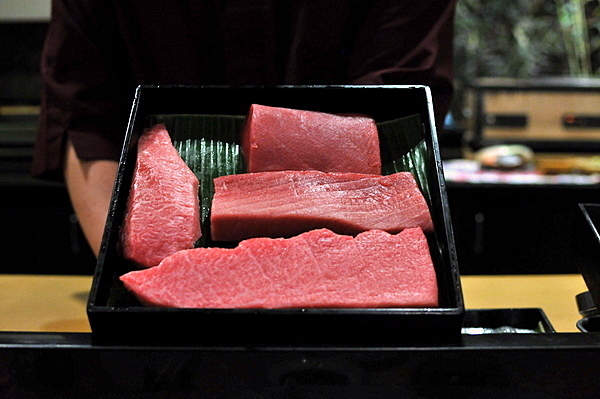 Nobu mentioned that Namerou is a common fisherman's meal in Japan. 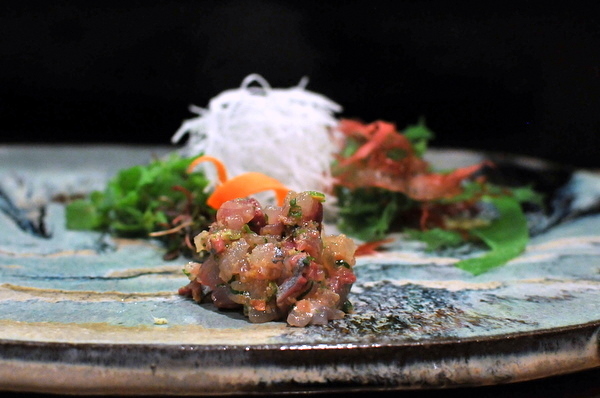 The minced fish is mixed with ginger, plum, shiso, and miso the hearty blend of sweet savory and aromatic is compelling especially when served with a fish robust enough to still stand out regardless. 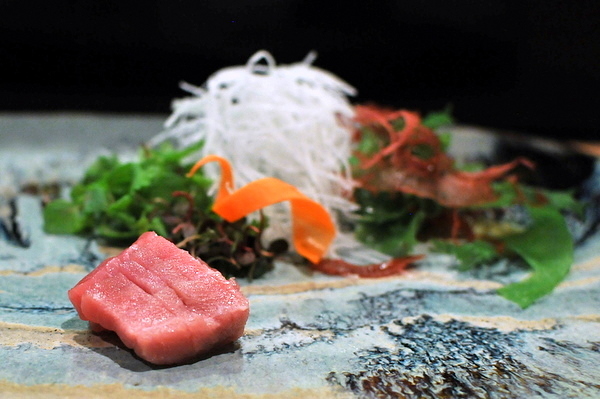 No sashimi course would be complete without the unbridled richness of fatty tuna. Tender and perfectly clean of tendon or gristle just pure lusciousness. 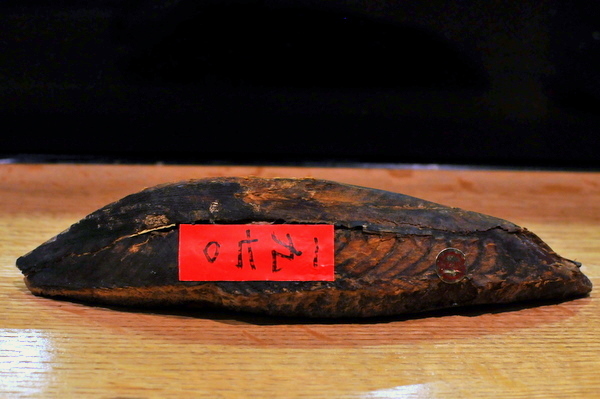 If you can believe it Kama Toro is even rarer and more expensive than regular toro. The meat has a starker marbling pattern, more like a cut of prime beef than tuna. 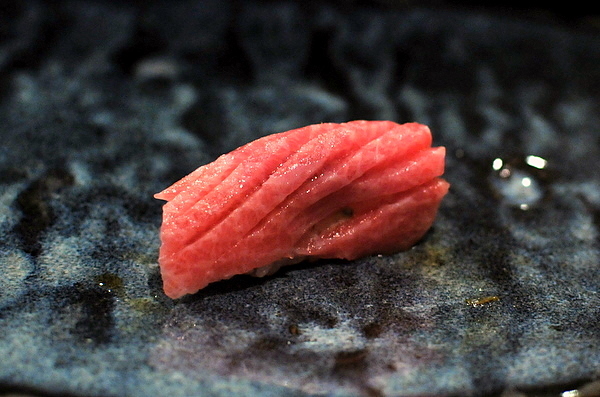 Despite having the brazen fattiness of toro, the texture is noticably denser and firmer. I appreciated the light sear on the tuna but could have done without the garlic chips to better appreciate the unadulterated flavor of the cheek. 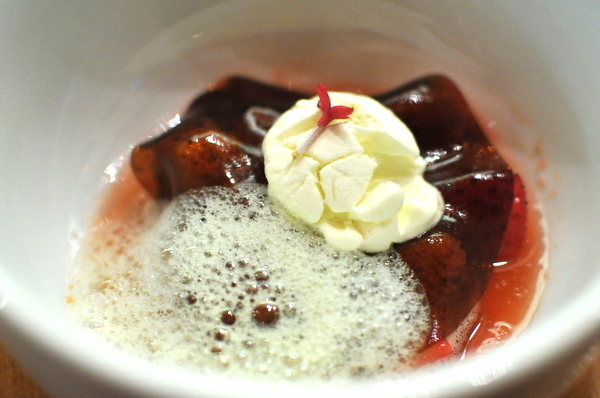 Nobu likened this to a seafood consomme and he couldn't have been more spot on. The turtle gives the soup a delicate yet clear note of salinity. The ginger and scallion add classic complimentary flavor but the real treat here are the lightly poached egg yolks and the lovely thickness they add to the clear broth. 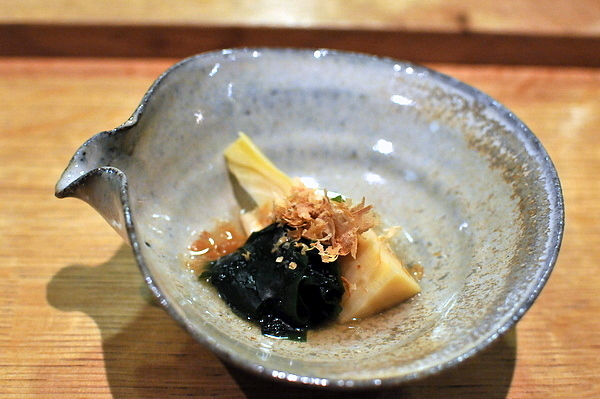 This is a popular springtime dish pairing fresh bamboo shoots with wakame seaweed. 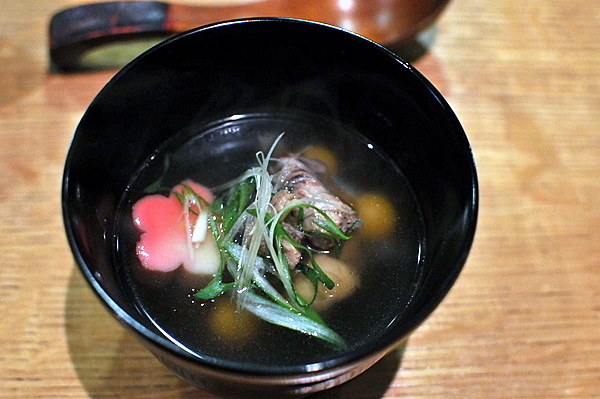 Another graceful course, the light snap of the bamboo and seaweed are enriched with a touch of dashi. 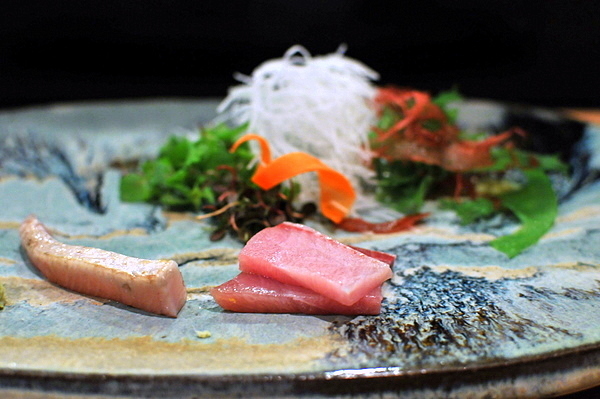 A generous shaving of bonito gives the dish a lingering woody backbone. 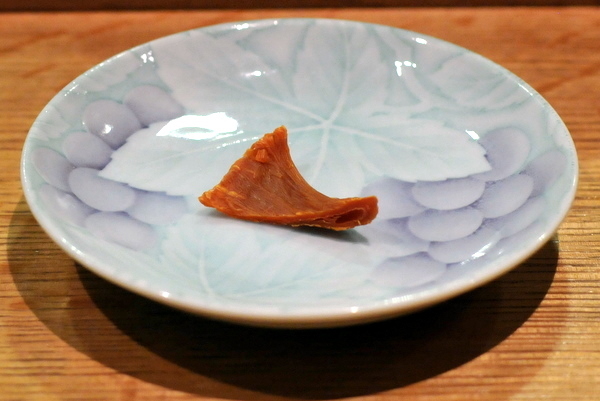 Nobu actually took out a piece of solid bonito to show and after aging for several years, it looked more like a piece of wood than fish. 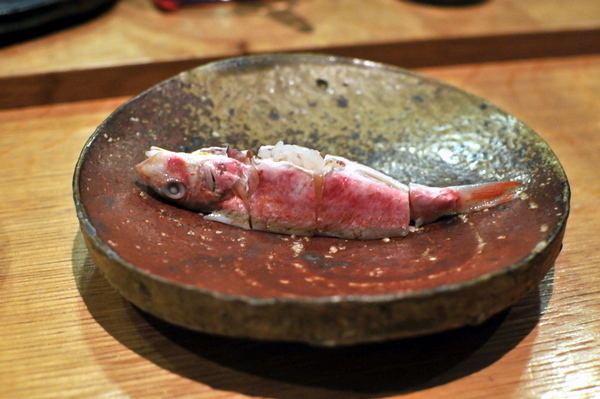 Coincidentally enough, right before Nobu presented this course I asked if he was licensed to serve fugu. He said that he wasn't but proceeded to present me with two generous pieces of the fish which naturally worried me a bit. Seeing my dubious expression, Nobu let me in on a little secret: any fugu exported to the US has to have the poison is removed so there was no real risk of me dying much as some of you may have hoped. 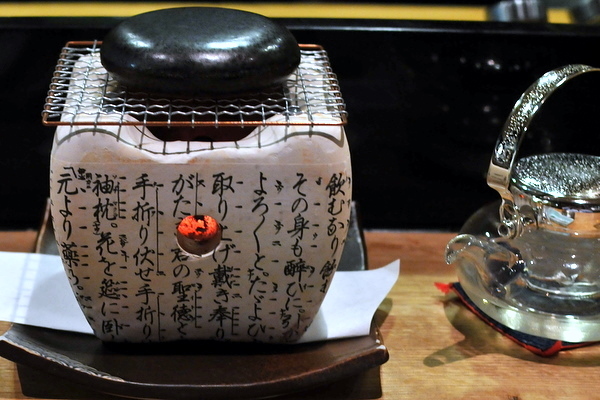 Puffer fish tends to be a bit tough so it either has to be sliced very thin or seared to soften the meat. Nobu opted for the second presentation and the resulting texture was quite unique, still some firmness but also a slightly spongy give. Apparently this is exceedingly rare even in Japan. 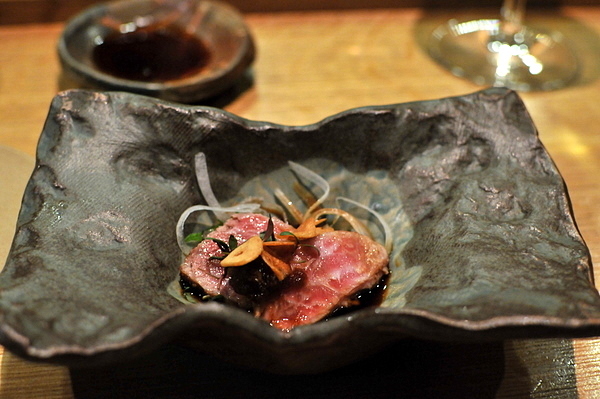 Nobu described it as a "seafood beef jerky" and that's almost exactly what it was. 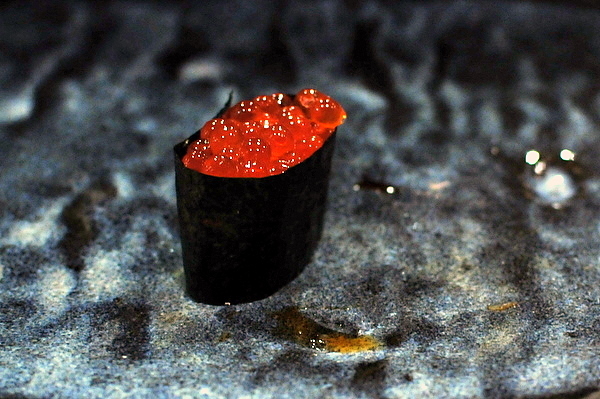 The roe had a fibrous texture very similar to jerky with a concentrated earthy umami flavor that grew with every sliver of the precious roe that I ate. 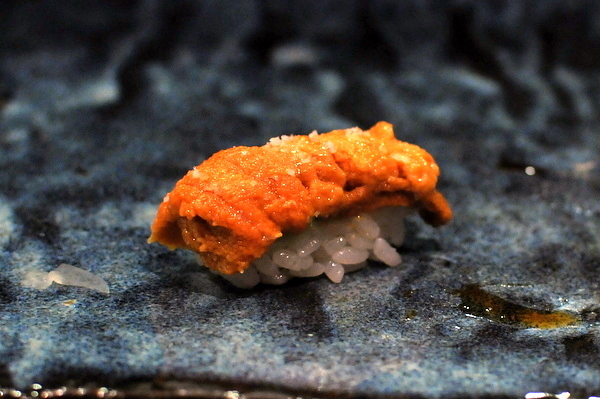 I've eaten sea cucumber more times than I can count but I've never experienced something with this kind of texture. Sea cucumber typically has a slimy texture but this was so dense that I could feel the muscles in my jaw strain with the effort to chew it. After being lightly poached in tea, the cucumber was dropped in a vinegar sauce giving a palpable pungency to the earthy flavor of the sea cucumber. If you told me a few years ago that I would have preference for different types of fish sperm I probably would have punched you but this was far and away the best shirako that I've ever had. Biting through the exterior membrane releases a creamy slightly salty fluid that is inexplicably delicious. This might be my first experience with crystal crab, a deep water species found off the Australian coast known for its sweet flesh and rich mustard. Less is more with this course, the interplay with the briny mustard and ambrosial meat is a thing of sheer beauty. This ended the Kaiseki portion of the meal and with the switch to nigiri, we were again given the option to order or simply leave it up to the chef. 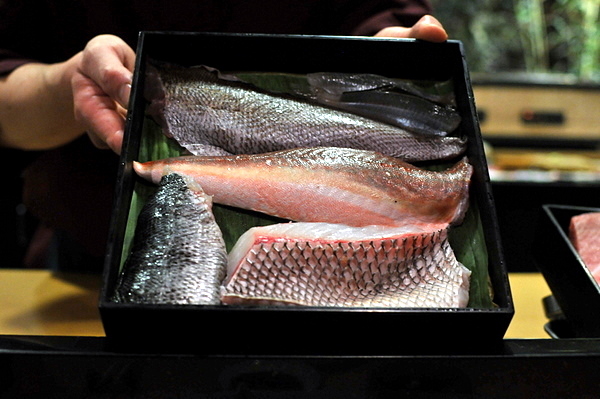 Nobu explained that Madai is important in Japanese cuisine and traditionally served at celebrations. 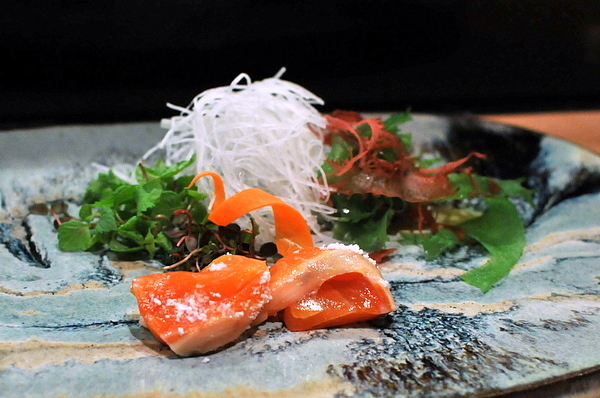 The fish was characteristically firm and came seasoned with salt and Japanese citrus. 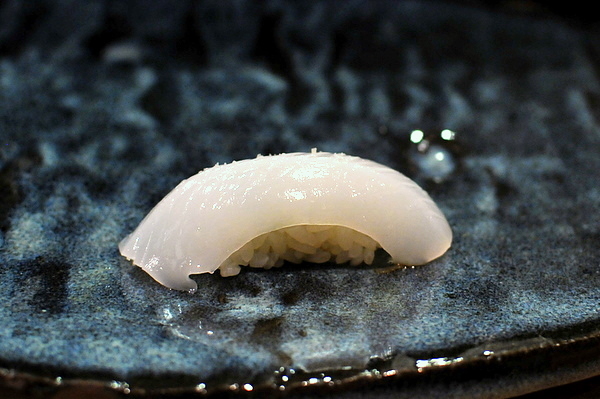 This was my first experience with belt fish nigiri. 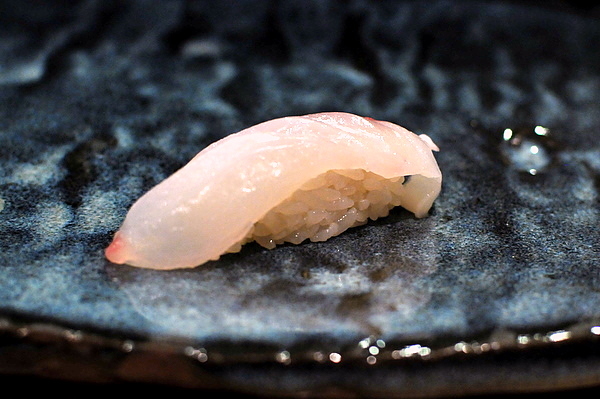 Nobu explained that this fish is best in summer and prepared this particular piece seared with the skin side down. 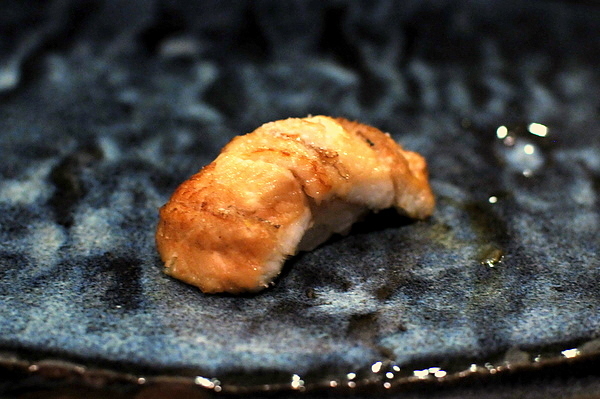 The fish is surprisingly dense while the sear gives the otherwise delicate flesh some flavor. Another first both the type of fish and the presentation. 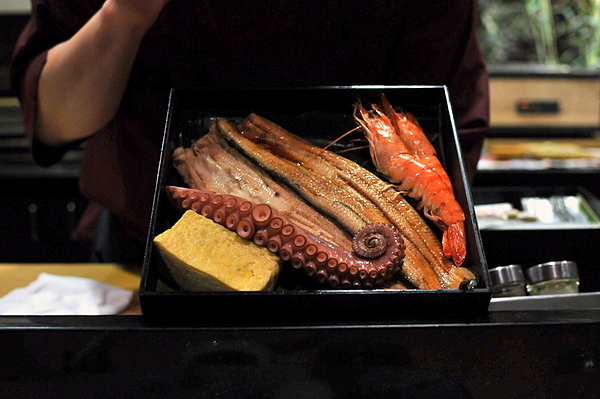 According to Nobu, this preparation and fish is a regional delicacy in south Japan. 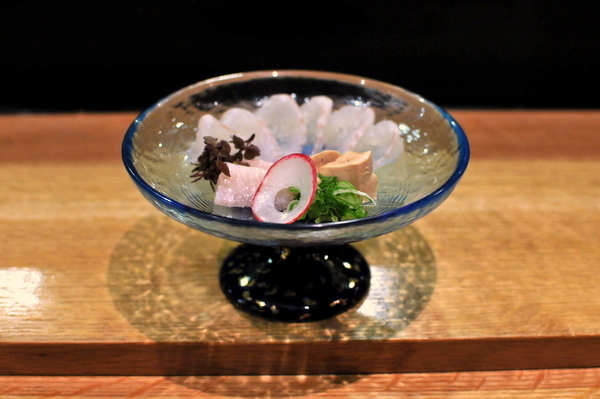 The fish is pickled giving it a nice tangy smack to go along with a sleek and tender texture. Tasting this fish it was hard to identify it as bonito. 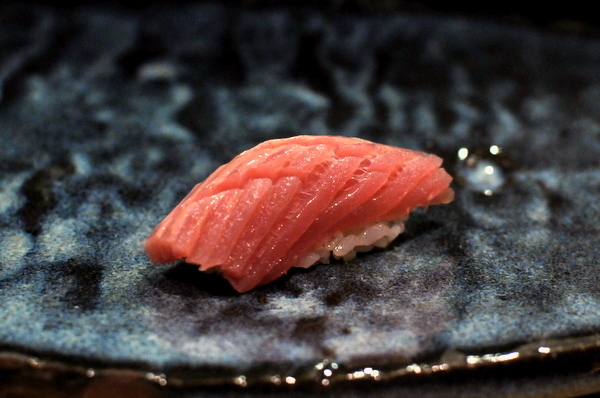 Apparently bonito leans down significantly during Spring and that came through on the flavor. I don't normally enjoy cooked shrimp nigiri but this was pretty tasty. 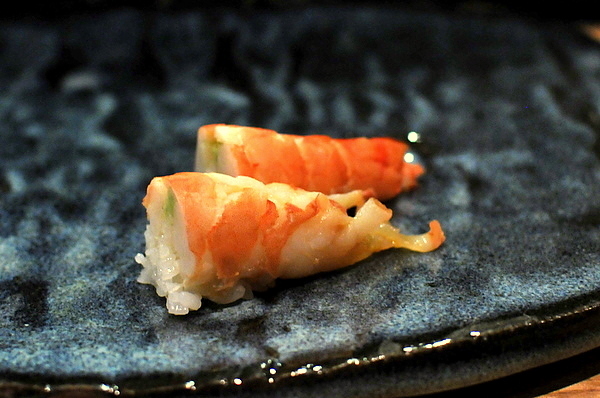 The larger Madagascar shrimp retains some of the snap of a raw shrimp while the flavor was more intense and reminiscent of lobster. 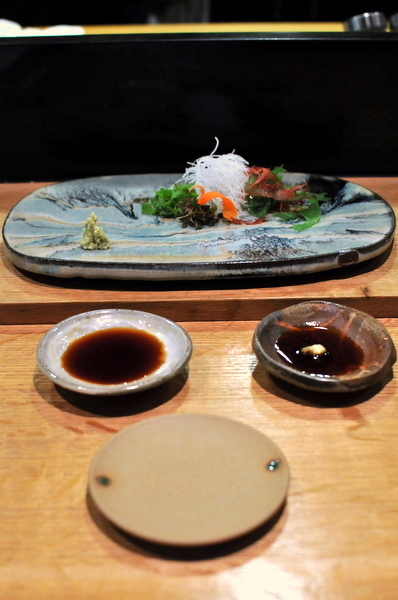 The anago looked almost fuzzy and the delicate fibers of the eel almost dissolve on the palate. Rather than the typical eel sauce Nobu opted for a lighter touch with yuzu and Okinawan salt making the eel's caramelized sapor quite apparent. While the fish was a touch firmer than normal, the flavor was pure fish oil goodness. Besides being a touch softer, I had a hard time telling the difference between this and regular squid. 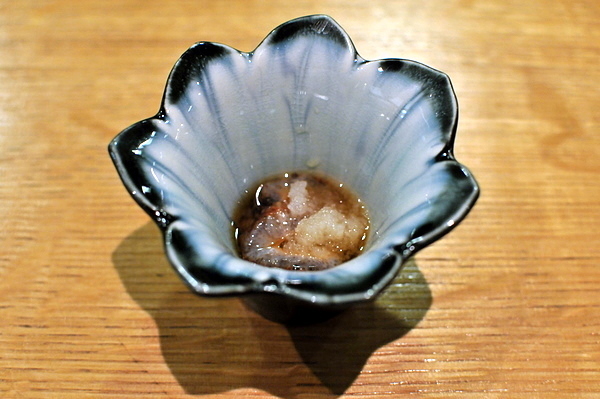 The light flavor of the squid is accompanied by salt and kabosu, a bigger less tart cousin of yuzu. I can't believe I made it this far into the meal without having a single piece of maguro. 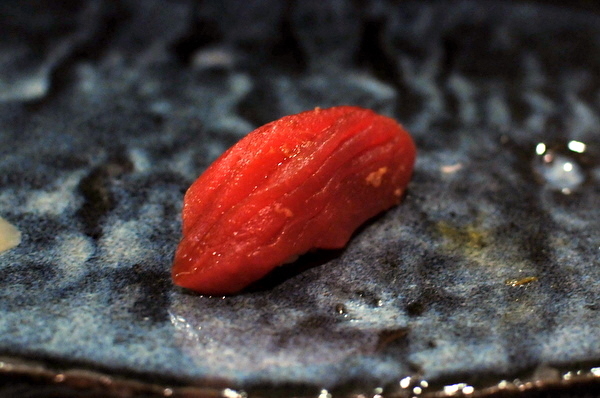 The fish already came infused with soy and was a touch smoother and drier than unseasoned tuna. Another immaculate and rich piece of luxury, despite wanting to try more unique goodies, its hard to say no to toro. 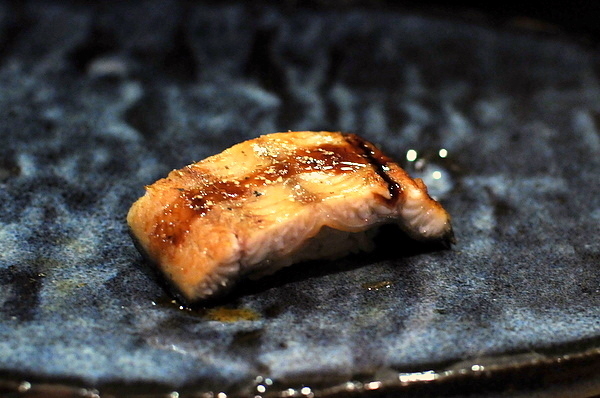 A stupendously rich example of unagi, the sweetness of the sauce is balanced by a numbing tingle from the sansho pepper. I've not seen this fish served at too many restaurants. 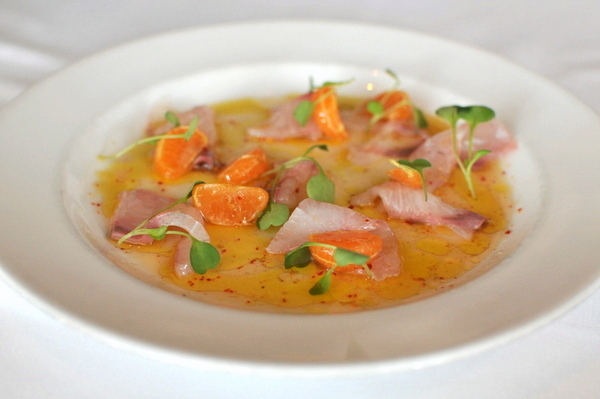 The fish feels delightfully firm and has a flavor somewhere between snapper and yellowtail. 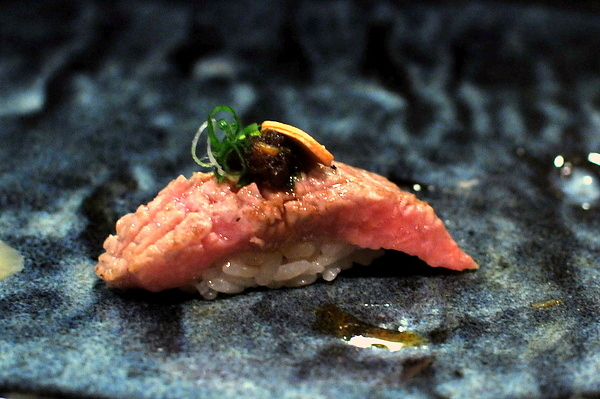 The tuna cheek also makes an encore appearance in nigiri form. More thoroughly cooked this time, the melted fat gave the meat a slight gumminess as well as an even more potent richness. Again I would have preferred a lighter touch on the accompaniments. Such a rare treat deserves to shine on its own. At this point Nobu asked if there was anything more that I wanted and I decided to end with Ikura and the Uni from Maine. The gunkan roll came topped with a generous helping of beautiful amber globules that release a rush of chilled smoky brine upon bursting. 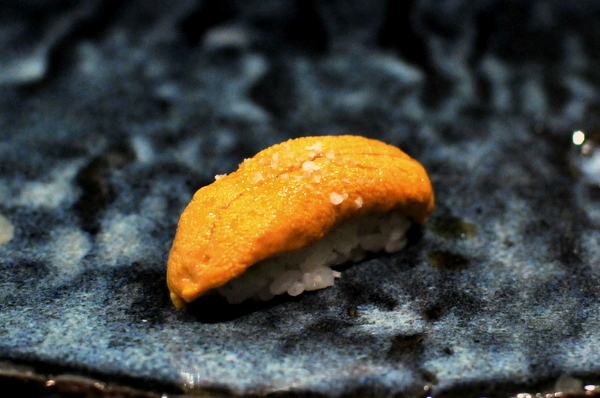 I initially thought this was Hokkaido uni but Nobu corrected me saying it was from Maine. 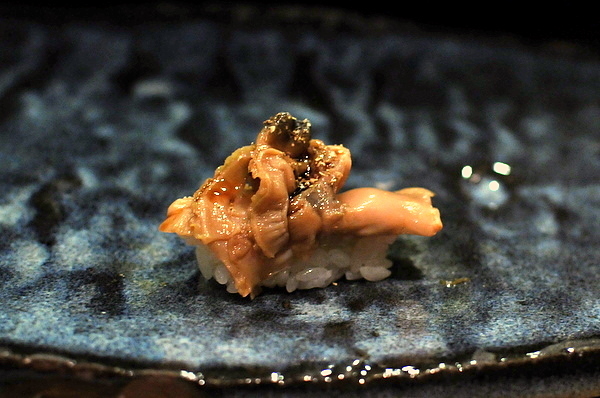 The flavor is similar to its Japanese cousin with a stronger brine SB Uni. 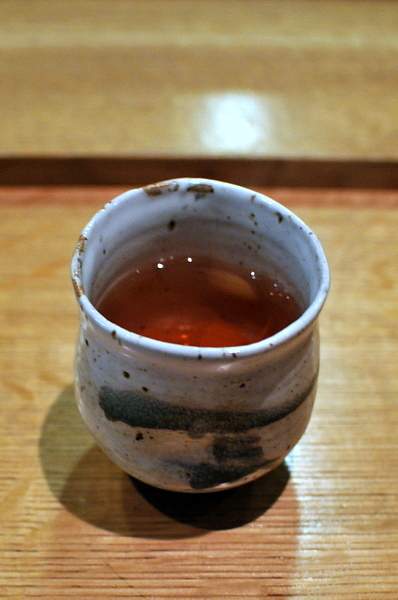 Hoji-cha is often served after meals to aid in digestion and after 39 courses I needed the help. 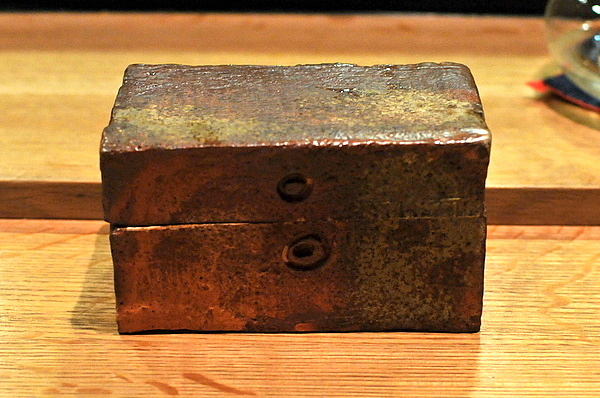 Despite its bitterness, hoji-cha is actually milder because roasting reduces the caffeine content of the tea. Desserts at Asian restaurants are so often afterthoughts but Sushi Taro has a number of more elaborate offerings. Unable to decide, I asked Nobu to go ahead and pick his favorite. 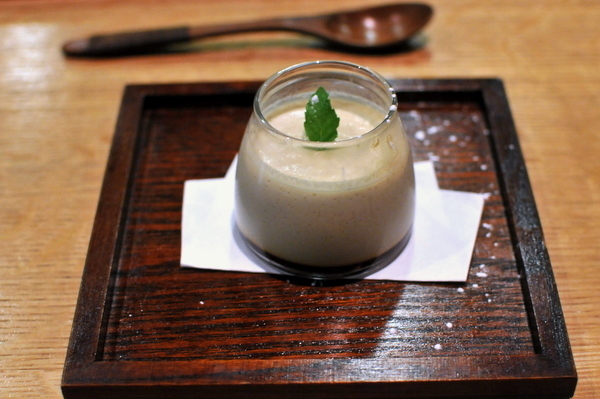 He went with an exquisitely smooth hoji-cha pudding tempered with a sugary caramel sauce. I love tea desserts and this was no exception. 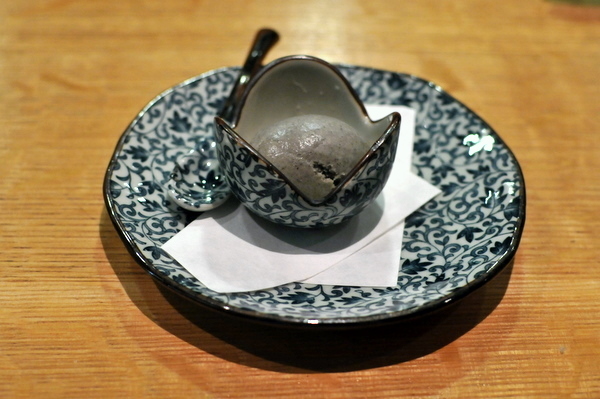 I mentioned my fondness for sesame ice cream so Nobu generously provided me with a small taste to cleanse my palate. At the end of the night Chef/Owner Nobu Yamazaki (left) and chef de cuisine Masa Kitayama (right) posed for a quick photo. Nobu's comment about changing Japanese cuisine in DC struck me as a bit presumptuous but after experiencing this meal it is clear that the young duo have the talent and drive to do just that. 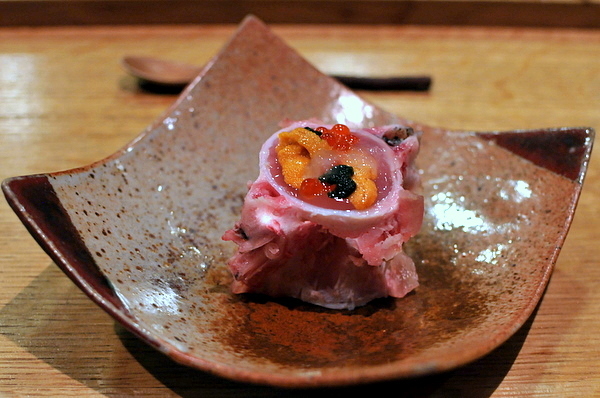 I had the Kaiseki Tasting and Sushi Tasting during one of my previous trips to DC and found the food to be quite good. The structure of the omakase counter is reminiscent but the personal attention of Nobu and Masa make the experience vastly superior. 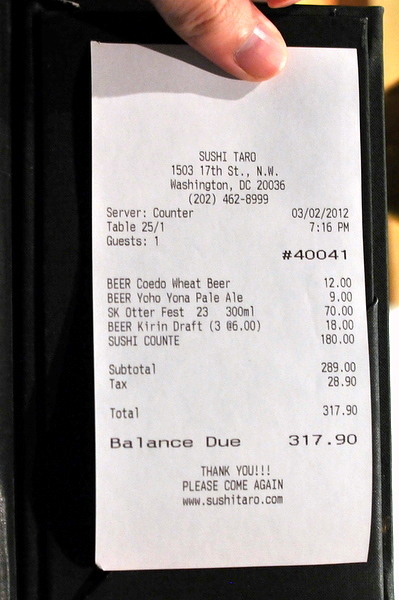 Though its pricey, Sushi Taro's Omakase Counter is without a doubt the best sushi in DC. 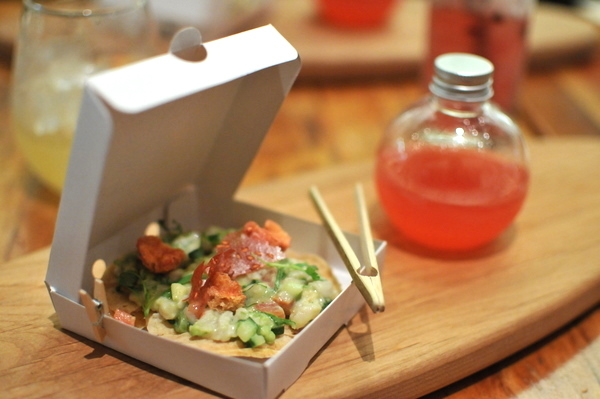 If you love sushi you owe it to yourself to try this.